Car Rust Stains are Stubborn!!! So Are Chocolate, Salt, Oil and Food Stains. Car rust stains aren't the hardest stain to remove as you learn how to clean a car or truck. 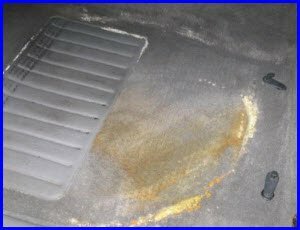 Even if you fail to totally remove the car rust stain, it just adds a little orange tint to the carpet or upholstery and it certainly doesn't smell like a urine stain in the car from a dog or cat passenger. But a stain is a stain and we must do a good job at car stain removal so our car feels good about itself, right? So here's some tips, ideas and products you can use to remove some of the stains that plague the average vehicle. Rust 1 : Car rust stains are pretty simple to deal with. Carefully vacuum up all rust particles/pieces. Blot with a solution of 1 Cup of White Vinegar to 2 Cups of Water. Saturate a white towel with the vinegar solution and lay on top of rust stain. Place a heavy object on top. Remove the heavy object and white cloth the next day and blot dry with white paper towels. If this fails call a pro to eradicate your car rust stain or check out this product for car rust stains . Rust 2 : Coit cleans more carpets than almost anyone else in the world. They have a great car rust stains removal page with two techniques that they use professionally. And just in case their freebie techniques don't work, you can always have the Coit Cleaning Person come to your house and do your car/truck carpets at the same time you take care of the house carpeting! There's also a movie at the above link with some nice step by step instructions on how to rid your carpeting of that nasty rust. Coffee : Dilute stain with a little cool water. Blot up water and coffee with white paper towels. Spray the stain with a glass cleaner like Windex and blot with white paper towels. Repeat if necessary. Blood 1 : Make a thick paste of dry laundry starch and cold water. Apply to stain. Let dry. Vacuum. Blood 2 : Blot with white paper towel. Spray with a mixture of 1/2 Cup of cold water and 1 Tablespoon of ammonia. Blot with white paper towel. Repeat if necessary. Blood 3 : Blot with white paper towel. Spray with a mixture of 1 quart of cold water and 1/2 teaspoon of Dawn dishwashing detergent. Blot. Repeat if necessary. Blood 4 : Blot with white paper towel. Spray with cold water. Blot. Spray with 3% hydrogen peroxide solution. Blot. Repeat if necessary. Ink : Spray with hairspray and blot. Repeat if necessary. Rekote makes an ink removal product for cloth and leather seats, dashboards and other interior parts. Vomit & Urine & Pet Messes : Wet stain with club soda, 3% hydrogen peroxide or Windex and blot dry. Repeat if necessary. A good commercial product is Natures Miracle - it's worked several times for me. Nail Polish 1 : Put some non-acetone nail polish remover on stain and blot. Then apply some Ten Seconds Shoe Cleaner according to manufacturers directions. Nail Polish 2 : Mix 1 Tablespoon Ammonia with 1/4 Cup of Water and apply some of this solution to the nail polish. Cover with a piece of plastic wrap and allow to sit overnight. Rinse. Blot with white paper towel. Red Wine or Red Dyes : Blot with white paper towel. Sprinkle some club soda on stain and blot. Repeat. Oil & Grease : Remove stain with WD40, Orange Cleaner or DeSolvIt. Rinse with soapy water and blot dry. Food Stains : Brake Cleaner will clean most food stains. Finish by rinsing with soapy water and then wet vac it dry. Optionally, wipe the mat or carpet with a rag soaked in a mild detergent solution and then blot dry with paper towels. This will help get rid of the brake cleaner smell. Many Stains : can be removed with Ivory Bar Soap and a toothbrush. Or try a mixture of 50/50 water/ammonia to which you add a couple of drops of dishwashing detergent. Parsons makes a product called Sudsy Ammonia which is similar to this recipe and works great on a lot of stains. Many Stains : can be removed using regular toothhpaste brushed into the stain with a toothbrush. Blot the toothpaste out with wet paper towels or spray the toothpaste with water and vacuum up with a Shop Vac. Blot dry with white paper towels. TIP : Don't rub a stain, especially car rust stains with a cloth or anything else. Apply your cleaning solution to a clean white cotton cloth and work the stain from outside to inside. Use a Wet Vac to pickup as much liquid as possible then blot dry with a clean white paper towel.